According to a report by the National Institute on Alcohol Abuse and Alcoholism, about 10 percent of the adult American population abuse alcohol or are confirmed to have alcohol abuse disorder. Patrick was one of them. Then near one New Year, he decided he would quit alcohol for good. The internet and the papers were full of how alcohol wrecked the liver and the heart and caused cancer, and Patrick was afraid. He didn’t want to land up in the hospital hooked to machines. Besides losing weight, quitting alcohol is one of the most popular New Year resolutions Americans make every year. But quitting alcohol is not like quitting sugar or junk food. You stop eating bagels and burgers and pizzas and pasta, and you won’t feel a thing except for those seemingly uncontrollable urges to dig into these foods. But you quit alcohol, and you might land up in the hospital as Patrick did. The day after Patrick had his last “beer,” the splitting headaches came on. He was moody and depressed and longed for a drink. But by next day, he was hallucinating. He was seeing and hearing things and had violent seizures. That was when his son decided to take him to the ER. After stabilizing Patrick, the doctors chalked out a supervised detox program for him. Yes, there’s something called an alcohol detox program, and this is the first step to alcohol addiction recovery. To know what is alcohol detox, you have first to understand why Patrick needed it. What Patrick went through when he went cold turkey were the classic alcohol withdrawal symptoms. While some withdrawals symptoms like headaches and nausea subside on their own and are at best, inconvenient, those like tremors, seizures, and hallucinations can worsen quickly and turn fatal. According to the National Institute on Drug Abuse, alcohol detox is a medically-supervised procedure where doctors safely manage and treat the physical symptoms of withdrawal. Detoxification is the first step in addiction treatment. To ensure a safe and stable withdrawal: By managing and treating the physical symptoms of quitting alcohol abruptly, doctors ensure that the person is safe. For instance, delirium tremens (DTs), a severe and potentially fatal withdrawal symptom, often sets in abruptly a day or two after having the last drink. It is critical that the vital signs of a person are monitored 24×7 to prevent the onset of DTs. To prevent relapse: The rate of relapse is the highest during the abstinence period. Many recovering addicts relapse when withdrawal symptoms become too unpleasant to bear. By managing the intensity of the symptoms, doctors not only keep people safe but also ensure that they do not fall back to their old habits. To get rid of the toxins from an alcoholic’s body: Alcohol is toxic to the body. Till the toxins leave a person’s body and he is fully cleansed, he cannot proceed to the next stage of the treatment process. The effects of alcohol on the body cannot be underestimated. To ensure a smooth progression to the subsequent stages of addiction treatment: Alcohol also damages the brain and clouds the thinking and reasoning processes. The presence of alcohol in the person’s body may impair his or her ability to think straight enough to appreciate the necessity of the treatment process. When the toxins clear out, he or she can be reasoned with and persuaded into seeking for alcoholism treatment. This eventually improves the outcome of the treatment. How long does alcohol detox last for? How long the alcohol detox lasts depends on the length of time the person has been abusing alcohol. Also, the amount of alcohol consumed every day, the presence of co-occurring physiological disorders, and the presence of co-occurring mental illnesses contributes to the length of the detox program. Withdrawal symptoms are usually severe when a person has been drinking for a long time or is a heavy drinker. The more severe the symptoms, the lengthier is the detox stage. 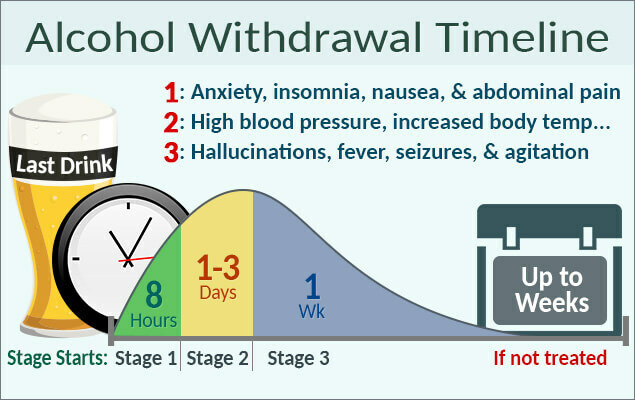 Alcohol withdrawal symptoms usually manifest about 8 hours after having the last drink. During this timeframe, the symptoms are usually mild, like anxiety, insomnia, nausea and/or vomiting, mood swings, loss of appetite, and fatigue. These gradually intensify and peak within 24-72 hours. At this time, moderately intense symptoms like increased blood pressure and body temperature, irregular heartbeat, and mental confusion may manifest. This is a critical period because some people may go on to develop severe symptoms like hallucinations, tremors, agitation, seizures, and DTs. It takes around 5-14 days to stabilize the person and bring the symptoms under control, provided there are no crises. However, the presence of co-occurring physiological and/or mental disorders can complicate the detox process and lengthen it. Where Does Alcohol Detox Take Place? Alcohol detox can take place in one of these locations: inpatient facility, outpatient facility, or at home. This could either be an alcohol treatment and rehab facility that also has detoxification specialists or a specialized alcohol detox center from where the person proceeds to an inpatient treatment from alcoholism. You have to stay at such a facility during the duration of detoxification. Round the clock medical supervision. The person is away from triggers. No alcohol is available in the facility. 24×7 Medical Supervision: Doctors and other medical personnel can monitor you 24×7 and address any symptom or discomfort immediately. No Exposure to the Triggers: During your stay here, you are away from the triggers that could have otherwise compelled you to reach out for a drink. No Exposure to Stresses: With no home and/or workplaces stress to bother you, you can concentrate fully on recovering. Not living in a stressful environment also means that there are fewer addiction triggers to overcome. No Access to Alcohol: You also won’t have access to any alcohol, should cravings arise—as they usually do during the withdrawal period. Not everyone might want to go through the detoxification process at an inpatient clinic. For instance, if you have kids or elderly parents to look after, you would not want to be away from home for long periods. At an outpatient detox facility, your symptoms will be monitored during the day, and you will be allowed to return home. Alcohol detox at home can be very dangerous and can even cause death if the withdrawal symptoms worsen quickly. 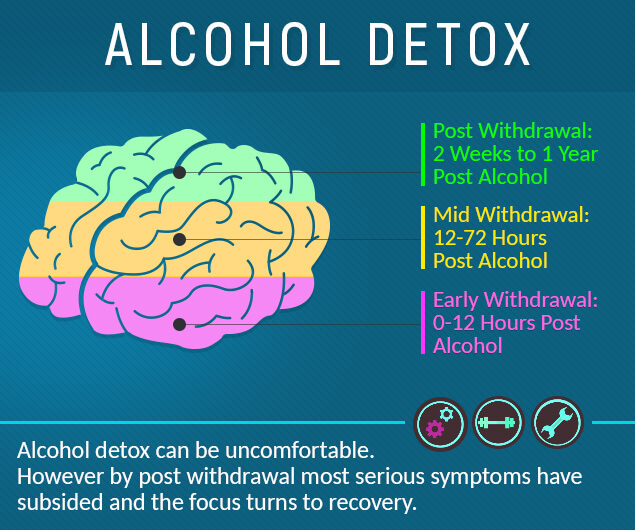 Also, failed detox attempts can increase the severity of withdrawal symptoms during the next detox period. DIY detox at home is dangerous because alcohol withdrawal symptoms can worsen quickly and cause a person to go into a coma or even die. Alcoholics or chronic alcohol users are not advised to do a DIY detox. And no, don’t expect that you can sail through a DIY detox if you taper off till you are not drinking at all. This is a stiff challenge for an alcoholic to pull off. If you have been drinking for long and generally drink more than the safe limit, then your brain and body will almost certainly react to even the reduced amounts of alcohol and trigger withdrawal symptoms. Besides the dangers of untreated withdrawal symptoms, DIY alcohol detox also heightens the risk of a relapse. Every failed detox attempt increases the risk that the withdrawal symptoms during the next detox period will be more severe. Consult with a doctor to find out if you can detox at home. Do not take any alcohol detox drugs without medical prescription. Make sure that a friend or a family member is around with you at all times (especially during the first 72 hours when symptoms peak) to monitor your health and withdrawal symptoms and to call for help, if needed. Educate yourself on the withdrawal symptoms, so you know when to call for help. Remove all alcohol from home. Ensure that your drinking associates don’t call in on you during the detox period. If there are family members who drink, you may want to stay somewhere else during the detox period, so you are not exposed to triggers or have access to alcohol. Stock up on easy-to-digest foods because you will lose your appetite during this period. Keep oral rehydration solutions and/or sports drinks handy. You may experience symptoms like nausea, vomiting, and diarrhea, and you will need to make sure that you replenish the lost fluids and electrolytes quickly. Alcohol detox drinks may be helpful; however, make sure to discuss their intake with a doctor. Exercise moderately to avoid feeling down in the dumps. Exercise is known to boost moods. Stock books, movies, and/or music at home that will keep you distracted when you have cravings. Write down all how you envision your life will improve after you quit alcohol, and display it somewhere you can see. When cravings strike and the urge to head out for a drink threatens to overpower you, read this list. According to the National Center for Biotechnology Information, an alcohol detox program consists of one or both of these two components: medication and psychosocial support. Medicines to Manage Withdrawal Symptoms: Some withdrawal symptoms can be managed only with medicines. Some medicines commonly used during alcohol detox are chlordiazepoxide and lorazepam. These drugs belong to a class known as benzodiazepines that affect the central nervous system and bring on a calming effect. These drugs are used to manage symptoms like anxiety and restlessness. Medicines to Boost General Health: Alcoholics tend to neglect their diets and often have nutritional deficiencies. Vitamins, folic acid, and iron supplements may be administered to help the person regain his or her health and heal quickly. Many alcoholics are deficient in vitamin B1 (thiamine). Severe deficiency of this vitamin can trigger neurological complications like memory loss and even cause death. So intravenous vitamin B1 is administered if alcoholics are diagnosed with a deficiency. Medicines to Reduce Alcohol Cravings: The alcohol withdrawal period is racked by intense cravings. Medicines like acamprosate, naltrexone, and disulfiram reduce the intensity of the cravings. These medicines are often prescribed to people undergoing detox at an outpatient facility and who will spend some part of the day at home or the workplace where they may be exposed to triggers or have access to alcohol. Medicines to Manage Co-Occurring Mental Disorders: Long-term alcoholics may suffer from co-occurring mental disorders that can worsen when the person stays away from alcohol. During the detox phase, it is imperative that doctors also treat these mental disorders with medicines. For instance, antipsychotic drugs like olanzapine and haloperidol are prescribed to treat symptoms of schizophrenia. Many rehabs for alcoholics provide an integrated detox therapy where medication is combined with psychotherapy to help a person overcome the withdrawal symptoms and prepare himself or herself mentally to stay off alcohol after detox. Though it is not a treatment, alcohol detox is the critical first step of addiction recovery. Treatment for alcohol abuse involves intense psychotherapy sessions for which the person needs to be physically and mentally stable. Detoxification prepares the mind, body, and spirit of the person and ushers him or her on the path of an alcohol-free healthy and productive life.